As a lead into WonderCon that starts today, the SF Chronicle wrote a great article on us local R2 Builders.Â Read it online or on the front page of the Datebook section. We’ll be at WonderCon Saturday and Sunday, and hosting another builders panel on Sunday at 12:30, room 220. Bonnie Burton over at the Official SW Blog did a real nice write up of our attendance at WonderCon this year, including some great photos and videos – check it out. 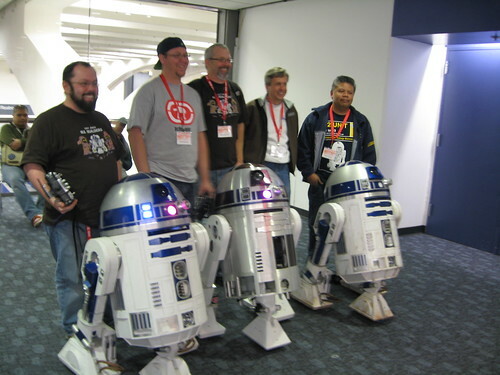 Here’s some photos and video from our WonderCon on Sunday, including our R2 Builders Panel. Sundays builders in attendance: Me, Steve, Matt, Grant and Gerard. This is the first year where we’ve done two days of WonderCon with our droids, but we were locked into Sunday because our panel was that day. With it being Easter Sunday we were a little concerned that attendance would be low. We were also going to be one of the last panels of the day, and on top of that they put is in a much bigger room this year. But about 10 minutes before the start people began to line up outside and we just about filled the room. We were told it was probably the fullest panel on the Mezz level all weekend. We bumped into Bonnie Burton from SW.com early on Sunday morning. After the panel was done we hung out side to try and answer more questions – And wanting to share I sometime entrust my Artoo for others to try out, this was Barry driving him. He’s one of the official WonderCon photographers who’s shared some great photos with us over the years. I owe a big thanks to Matt for organizing our attendance this year, and also to Gerard for coming back in on Sunday to help as our backup handler. I can’t stress enough how important it is to have an extra set of hands. As far as I’m concerned it’s almost impossible to have a stress free day if you try and attend an event like this on your own. As usual many more photos can be found in the gallery. 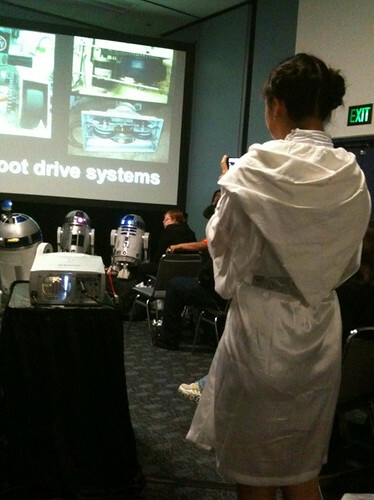 Bonnie Burton shot this video of my Artoo at WonderCon this morning. Enjoy. Link to the original youtube video. Here’s some photos and video from our first real day at WonderCon. Nearly ever droid builder I know lugs around a large cart just in case their droid fails. This is especially needed for those of us with drive systems that lock when no powered is applied to the motors. Knock on wood, I’ve never needed to use my cart and it’s always stayed in the van. Well, at WonderCon last week Gerard showed us his latest find – mini 6″ tri-wheel dollies that’s can easily be place under each drive wheel. They’re small and light enough to throw in your backpack or toolbox. Only downside is the wheels are pretty small so wouldn’t go over any major bumps or door jams easily, and I wouldn’t recommend using them to totally replace your cart, especially if you use it all the time. Never the less, I went straight out and bought a set to have in case of an emergency.